I was thinking what is there about Fair Play that makes it so interesting? That is simple -- The Gold Rush ! During the 1850-1870's Fair Play was an important part of the Gold Rush environment. Fair Play was home to many saloons, hotels and places for the 49ers to find themselves some trouble. In fact, the name of Fair Play has it roots based in the gambling that dominated every establishment.Fair Play got started by two gentlemen, Charles Staples and N. Sisson, who arrived about 1851. The story goes that some time after that the two apparently fell into a disagreement about gambling that grew into what must have been a not-too-gentlemanly fight; the town lawman had enough of all the crooked gambling. One day he marched into the biggest saloon, drew his Colt 45 and fired one shot through the floor. When everyone was paying attention to him he hollered, "Listen up. I'm a tellin' ya there ain't no more cheating in this town. Here it's fair play. We follow the rules." As he pointed his 45 around the room to everyone someone yelled, " Yep, it's fair play. That's what it is here, it's Fair Play." That name has stuck every since. True? Who knows. It is a good story we in Fair Play like to tell our visitors. 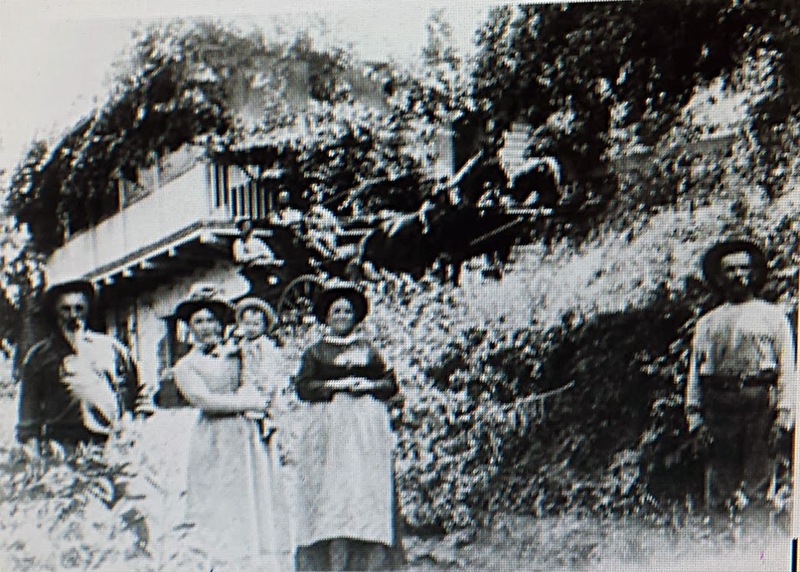 Fair Play was part of the Gold Country Mercantile network.By 1860 the post office was established in Fair Play with George Merkindollar as the first postmaster (he also owned the hotel that housed the post office). By that time the business section of town had grown from a few quickly erected tents to several stores, owned by Purrinton & Carr,- A. Church and J. G. Carr; the hotel owned first by Mr. Merkindollar, which was later sold to M. N. Remich and then George Washington McKee; a Saloon, butcher shop, carpenter's shop and a blacksmith. As mentioned, unlike many gold rush "boom towns", the town did not die as mining slacked and the miners left, mainly because of the quality of the soils for agriculture. The surrounding towns had their own specialty products to sell the 49ers. This map helps you understand what is in the area around Fair Play (see if you can find the different places I write about here.). Up Omo Ranch Rd about 10 miles is Omo Ranch. In it's heyday it was called Indian Diggins. The Miwok Indians were gold miners and their neighbors became loggers. There was a lumber mill and some shops. They milled the lumber so the miners could build their cabins, houses, sluice boxes and all the other things. Aukum, as it was known until the name change to Mt. Aukum in 1961, was the site of an early post office that started in 1895. It was the center of the agricultural activity up and down the stage coach route between Somerset/Grizzly Flats and Plymouth in Amado County and five miles from Fair play, Mt. Aukum served as the farmers market for the 49ers to get their produce like corn meal, grain, beans, bacon, jerky and vegetables. Economic downturns in agriculture nationwide beginning in the 1870s to the Great Depression and a decrease in population of El Dorado County took a large toll on the wine industry. In 1966 there were only 11 acres devoted to wine production in all of El Dorado County. The Higgins’ Zinfandel crop located near Mt. Aukum was similar in size to the amount of acreage devoted to wine in 1855.